Gypsy wagon Bed and Breakfast experience. 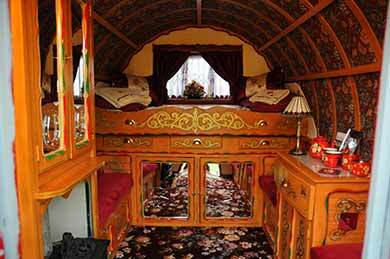 Are you looking for something different with a romantic touch?, Then come and have your own little Gypsy Bed and Breakfast experience, staying in our luxuriously refurbished 2 berth cosy genuine Gypsy Wagon, which has a Queenie Wood burning stove and radiator. Tea and coffee making facility. Snuggle up in the 3/4 size pull out bed, with radio, cards and dominos provided. We have a well equipped chalet behind the Wagon for your own private use, to dine and shower etc. You will have all you need to prepare for yourselves in your own privacy and at your own leisure your continental breakfast. Your toiletries and towels are provided, just bring a toothbrush! We are located in the beautiful rolling countryside of the Alkham Valley Nr Canterbury in Kent, 10 minutes from the M20 and 5 minutes from the A2 & Dover. Our Gypsy Wagon B & B is situated in our picturesque garden nestled in the Kent countryside, overlooking open fields with woodlands close by. You will see many forms of wildlife around and about including foxes, pheasants, badgers, rabbits, woodpeckers, owls and much more, which can also be spotted from our own location (so bring your binoculars).